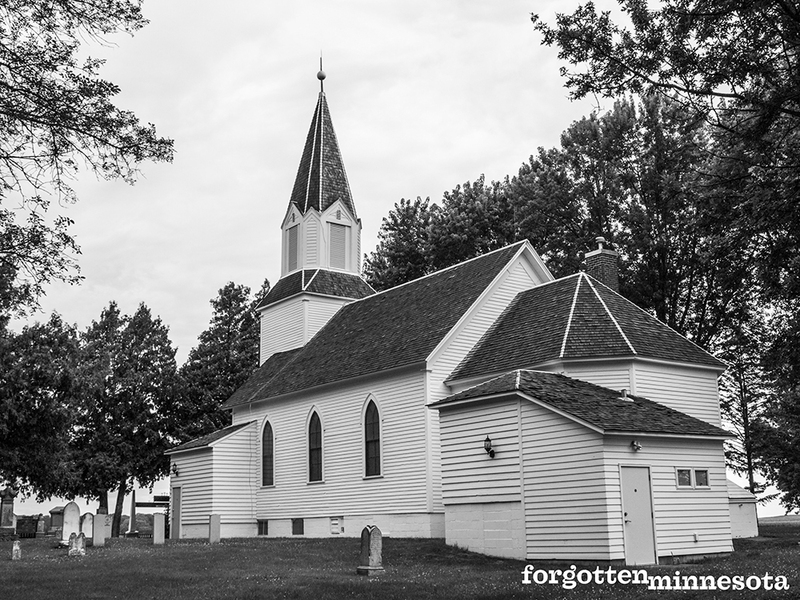 The Ness Congregation was originally organized as the Norwegian Evangelical St. Johannes Congregation of Meeker and surrounding counties in 1861. The name was changed to Ness in October of that year. By 1864, the congregation had raised the $100.00 needed to purchase forty acres of land that had previously been set aside as a cemetery since the first interment there six years earlier. This land would eventually become the home to the Ness Lutheran Church, Ness Memorial Cemetery, a state historical monument, and the original granary where the congregation’s first services were held. Between 1861 and 1868, sixty-five people joined the Ness congregation. Services were held in a granary built by Ole H. Ness. The first confirmation took place in the granary in 1861—members of the confirmation class were Even Evenson, Ole Kittleson, Hans Johnson, and Helle Kolberg. Many baptisms and weddings were presided over by guest pastors in the Ness granary before a permanent pastor was found and the church building was constructed. The congregation received their first dedicated Pastor, Reverend T. H. Dahl, in 1868. The Dahl family came to Meeker County with a group of Swedish immigrants who settled near New London and Swede Grove. Dahl initially moved into a log house in the woods owned by Ole Larson until a parsonage was built in 1870. Pastor Dahl and his family lived in the parsonage, a modest log home just north of the present church building, and farmed the land as part of his wages. Now that they had a dedicated pastor, the congregation needed to decide where to build the church. In 1868, the congregation decided to split into three: Ness, Arndahl, and Throndhjem. To help raise money for the new Ness church, Pastor Dahl and his wife established the Kvinden’s Sy Forening, or the Women’s Sewing Society, where the women would get together and knit, sew, quilt, and spin articles to be sold at an annual community auction to benefit the church. It was decided that the Ness Lutheran Church would be built on the forty acres purchased in 1864. Pastor Dahl had moved to Wisconsin 1873, and the Ness Lutheran Church was being led by Reverend Ole Hanson Bostad. After years of meeting in the granary, a barn, private homes, and a schoolhouse, the church was built in the spring and summer of 1874. Before the harvest that year, Reverend Bostad left and was replaced by Nils C. Brun. When Brun arrived, the church had already been raised, but the interior work had not yet been completed. Brun sparked the congregation to hurry the work and complete the church over the fall and winter. Since most of the congregation were farmers, the bulk of the work was completed after dark. Ole Amundsen, Henrick Thoen, Halvor Olson, and Hans Evenson were regulars at the building site and brought their strong, youthful sons with them to complete the work. Ellef Olson carved the baptism font out of a basswood log, and the Women’s Sewing Society made curtains for the windows and donated $100.00 to pay for the altar and pulpit. Many other members of the congregation did their part to complete the church too—everyone was excited and willing to do their part. The cost to build the church totaled $798.57; Lumber - $409.82, labor - $284.25, paint for the spire - $16.00, nails and hardware - $45.00, cement for the foundation - $3.00, altar cloth - $10.50, and freight costs from Minneapolis - $30.00. In 1878, J.P. Johnson donated the first bell. He had it cast for $25.00 while he was visiting Chicago. Before having it placed, the steeple was reinforced and enlarged at a cost of $181.70. Ness Lutheran Church continued to be lovingly maintained and upgraded by the congregation for more than a century. During the summer of 1879, the church was given its first coat of paint, both inside and outside. The exterior was painted white, and the interior was painted brown and light blue. In 1899, a larger bell was donated by the Soreness family to replace the original bell. The interior of the church was again refinished by the Ladies Aid, and a partial basement was dug to make room for a hot air furnace in 1907. Women of the church were given the right to vote in church affairs in 1925. The Ladies Aid took on refurbishing the interior of the church yet again in 1927. At this time, the wood-paneled walls and ceilings were covered with tin and painted, the altar was painted, the wooden floors were covered with linoleum, new carpet was laid in the chancel, and the roof was re-shingled at a total cost of just under $900.00. Electricity was installed in 1937. The foundation was stabilized and a full basement was added in 1947. The church basement housed a dining parlor, a modern kitchen, and a new heating system. As it turns out, the painted tin walls and ceilings didn’t last long—they were replaced with new wood and oak paneling in 1950. A new Wurlitzer organ was purchased in memory of Charles R. Ness to replace the Estey organ that had been purchased for Easter in 1958. On September 13, 1878, at 2:00 p.m., more than one thousand people, including Governor Alexander Ramsey, attended the dedication of one of the state’s first historical monuments. A slender, fifteen-foot tall obelisk was placed in the cemetery on the north side of the church to mark the common grave of the five settlers killed during the Acton Incident, which sparked the U.S.-Dakota War of 1862. 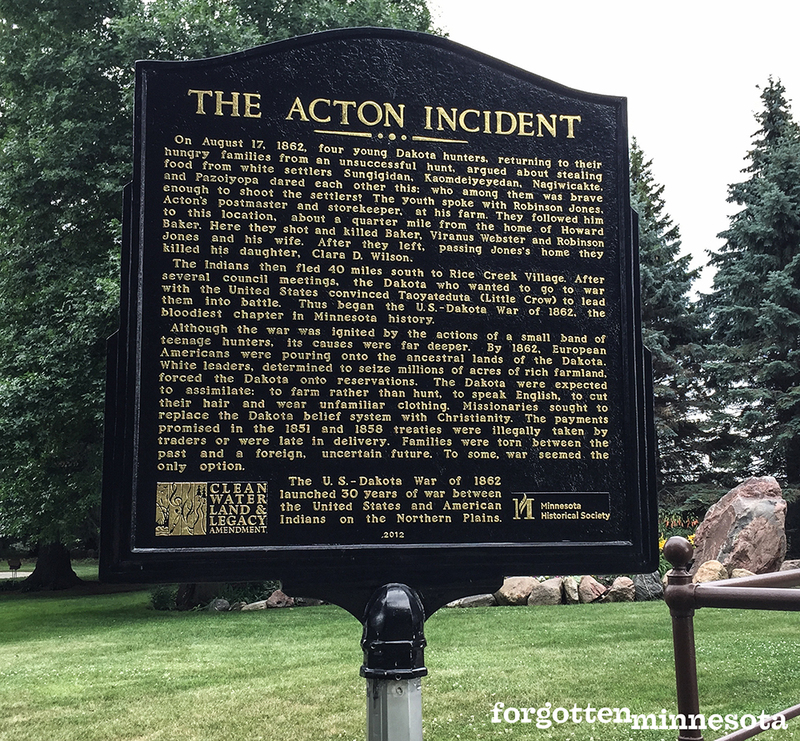 Acton Township was located just five miles west of the church. In June 1963, the Cemetery Association was organized. The forty acres that had been purchased for $100 in 1864 was turned over to the association with the caveat that the land would never be sold except for cemetery use. The cemetery was improved in 1964—fifty new trees were planted, and all of the head and foot stones were reset in concrete. A rededication of the cemetery and state monument took place later that year with Governor Karl Rolvaag and Russell Fridley, Director of the Minnesota Historical Society, as speakers. The Ness congregation voted to disband on December 31, 1968. All of its assets and the church building were left to the Cemetery Association, which was renamed the Ness Memorial Cemetery, to be kept as a memorial to the congregation and the early pioneers of the area. The final service was held at Ness Lutheran Church on December 29, 1968. The church grounds and cemetery are open to the public in the summer (May through September) from 8:00 a.m. until 9:00 p.m., and in the winter (October through April) from 8:00 a.m. until 5:00 p.m. The church and granary are open on special occasions and by appointment only. Ness Lutheran Church Centennial. 1974.